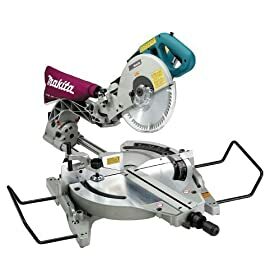 The Tool Crib – Best Compound Miter Saw for Laminate Flooring? A SawmillCreek member recently asked his fellow creekers about the right tool for cutting laminate flooring. He’s eyeing a miter saw in the $300 range, but is open to other suggestions. 1) Do you recommend a good blade for my Circular or get a Compound Miter Saw for the cross cuts? 10” Sliding or a 12” non sliding? The forum responded pretty much unanimously that the Makita LS1013 would be his best bet, the only problem being that it’s about $150 over his outside price. Q/A: Sawzall Question – changeable blade positions? If you are doing laminate flooring why invest $300+ for a saw that can only cross cut when you’ll need to rip as well??? I suggest you consider laminate flooring saws made by Makita, Skill, or Ryobi which sell for around $150. They use a small 5″ carbide blade, they are lightweight and can rip, cross-cut or miter up to 3/4″ of flooring.